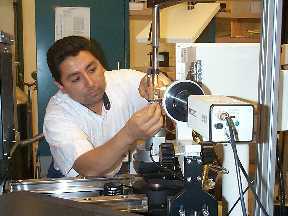 The Department maintains a well equipped x-ray laboratory with two comprehensive macromolecular crystallographic data collection systems (including cryocrystallography). 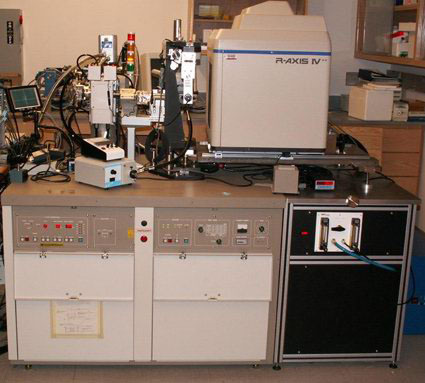 A complete state-of-the-art system, installed in 2003, is comprised of a Rigaku RU-H3RHB X-ray generator, a confocal optical system (blue configuration), an inverse φ axis, an MSC R-Axis IV area detector, a 2θ stage, an X-stream cryogenic system, and a control computer. The second system is based on a Rigaku RU300 rotating anode generator and R-AXIS II imaging plate detector mounted on a 2θ, with the x-ray beam focused by a double focusing mirror collimation system. These instruments are part of the Boston University Core Facility for Macromolecular Crystallography directed by Dr. James Head. A variety of computer workstations and software are available in the Department for data processing and structure determination. A Buerger precession camera is available for single layer precession pictures. The Department also maintains two high flux GX6/GX20 rotating anode x-ray generators. Low angle x-ray diffraction cameras with high spatial resolution, include two double mirror focusing cameras and a toroidal mirror focusing camera. 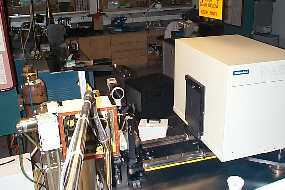 A single mirror line focus camera, coupled to a one dimensional position sensitive detector and computer controlled data collection/reduction system is also available. These instruments are directed by Dr. David Atkinson.